The company performance management application develops a company culture built on employee engagement and employee performance. Increase your human capital profitability and drive the company’s net profits. Performance Management has never been easier for tracking your Human Capital than with the Performance Management Application, Performance Scoring. Build a better culture, one of accountability, responsibility, and success with Performance Scoring. 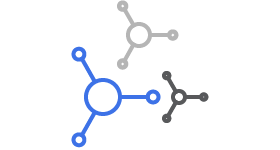 With Dynamic Org Charts, hierarchical by nature, view your individual teams performance, and their team performance, with up to the minute performance visualizations. Locate who is growing and loosing company profits. Factor focused, with each factor created and valued by you, specific to your roles and company. They are score able on any device- straight to your performance cloud. View factors that are affecting your profit instantly. We know it is your job to make sure the company is being as profitable as possible and grow your net profit each year. Performance Scoring lets you know exactly who your top and bottom performers are, enabling you to address areas of the company that are directly effecting your profits. Performance Scoring gives you a tool to help train up to better utilize your company’s human capital, growing your net profits. Through greater performance engagement, employees productivity increases. Real-time feedback means engagement is everyday, all day. Constant Performance Management increases top line revenues that can been seen all the way down to the bottom line. Helping people understand their performance is not only a corporate investment, but a personal investment. Caring, through feedback, then building people up, lowers attrition. Knowing which Factors are leading to an employee’s success and those that are inhibiting it, means you can coach and train to the specific areas of need to grow company profits. Knowing the exact areas employees are struggling in allows you to address and coach on the areas in which loose the company money. Decrease failures and increase profits. Performance Scoring companies see an average ROI of $20 for every $1 spent on the application. Generating profit through knowledge. Building a profitable team means having the tools to build profitable teams. With Performance Scoring, our tools are designed specifically for you. Fostering strong culture, lowering attrition, and higher profitability. Built with Dynamic Org Chart, instantly see your company score, your team score, your score, built to only show those that report to you, and their information. If they are a manager, see their team’s score, as well as each individual below to infinity. Powerful dynamic drill charts for everyone, from employee to manager, all the way to the top. 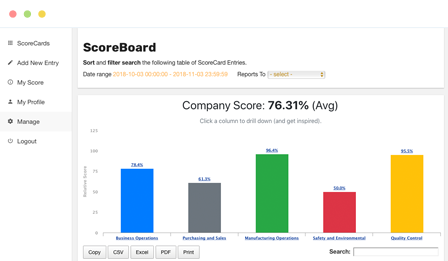 Drill into each ScoreCard Category by any date range and find the top, median, and bottom performers, along with all the Factors that dictated their placement. Detailed Usage Reports allows a better understand to user usage. See how users are participating and valuing performance management. From how many times they logged in during a specific time period, to how many times they score. Ensure you’re getting your money’s worth. View each Factor scored to each user, from individual, teams, to those that report to. See each entry that led to their performance score over any time period you choose, and see the areas that growing and decreasing your profit margins. Ensure users are viewing performance through the use of the applications Push Notifications. Set the time and date to send data, and give the company another tool to send out before meetings and reference during. "Performance Scoring brought an increase in productivity and performance to our company. With an importance placed on employee engagement and development we are experiencing lower attrition and are able to promote from within." How Do Company's Get Their Employees To Engage in the Application? What is the average ROI companies see using Performance Scoring? The average ROI of a Performance Scoring client is $20 for every $1 spent on the application. How Does Performance Scoring Lower Attrition? Performance Scoring as been proven to lower attrition for companies due to the objective data it creates. Employees know the exact exceptions for their company role and are given a tool to personally address their performance within the company. Employees feel valued and empowered in their work leading to lower attrition. How do we fit this in our budget? Companies should see a greater ROI then the monthly cost of the Performance Scoring application. However we want to preference it as this, is having objective employee data worth the cost of buying lunch for your employees? That is what it will cost your company, the price of lunch for your employees, to purchase the Performance Scoring application. Do we have to pay for maintenance/retention? Not with our supported version, the Performance Scoring team will ensure your application is running smoothly and will keep you up to date on all of our newest updates. Can we ensure our employees are using the application? Yes, you can ensure employees are using the appliaction. You view the Usage Report and see how many times each employee has logged into the application and also how many scores they have entered. 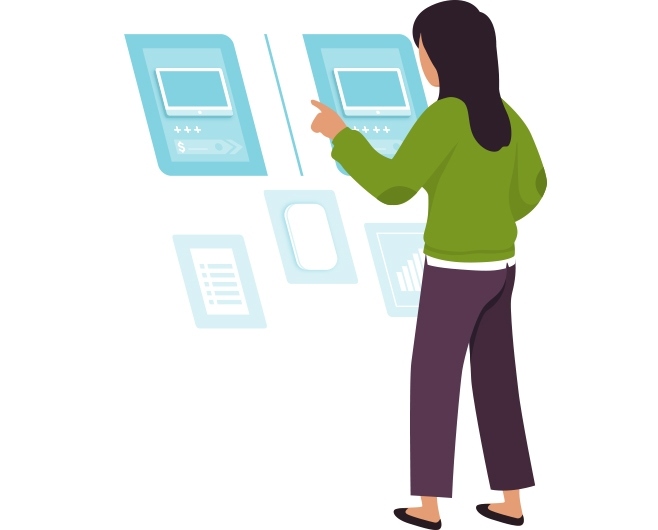 Another tool to make sure employees are viewing their scores is the applications email push notifications, which are available for any time period you set.